With what started out of practical piece of clothing for fishermen, the Aran jumper remains a practical and classic stable in our wardrobes. 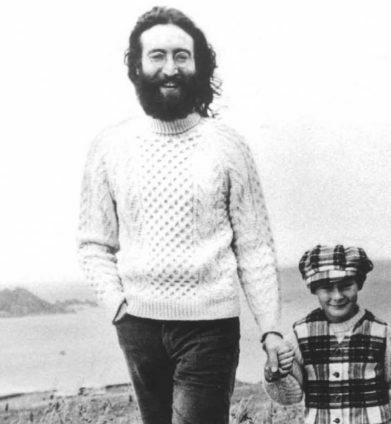 The Aran jumper started out a fisherman’s jumper and as you may have guessed, got its name from the Aran Islands. 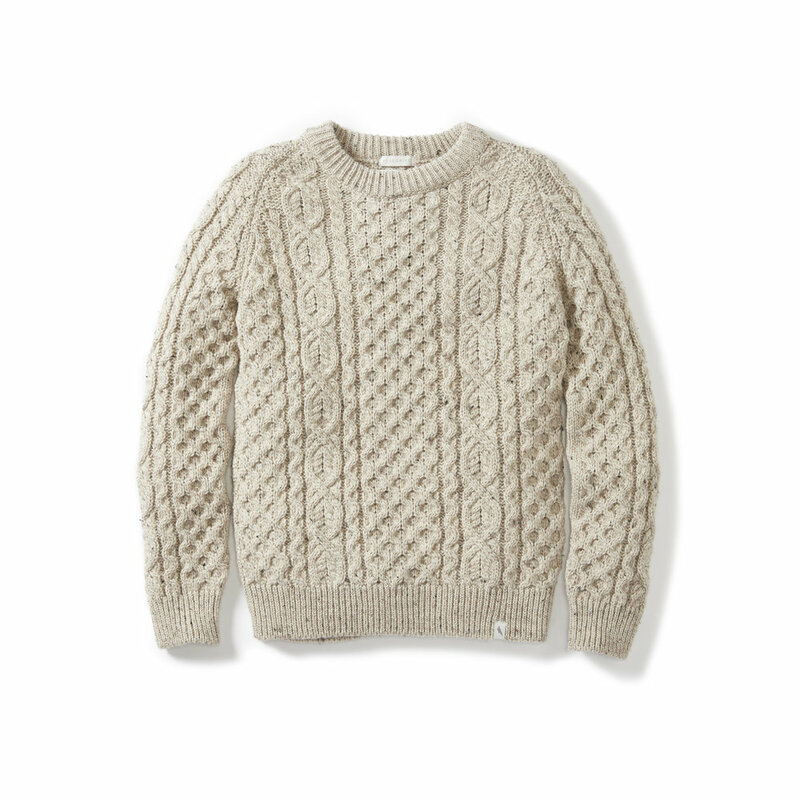 Aran jumpers were traditionally made using unscoured wool that still contained the sheep’s natural oils (lanolin). These natural oils made the jumper resistant to water - the ideal garment for a fisherman! Traditionally the jumpers are an off-white colour that has come straight from the sheep undyed. There is also an interesting history behind the different knitting patterns. Each knitting pattern has its own meaning. The most popular and common knitting pattern is suppose to represent the fisherman's rope and wearing it was mean to mean you would have a good day at sea. Signifying the fields of the Aran Islands and fishing nets. Represents the ups and downs of marriage and also the winding paths of the Aran Islands. (Above)Steve McQueen on the set of Thomas Crown Affair (1968) wearing a classic Aran knit jumper paired effortlessly with his signature sunglasses. One of our best selling garments, our 5gge men's Aran knit in 100% British wool and 100% made in the UK. The chunky yet stylish jumper is a classic style that has been revived using a textured yarn and neat cable detailing that is reminiscent of the Irish Fisherman jumper. This robust knit will see you through the lowest temperatures as you continue to look great. 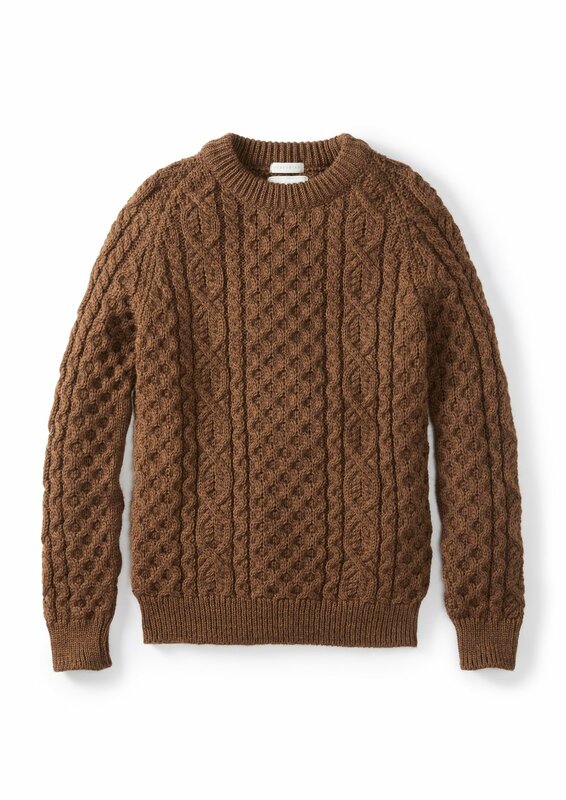 We make them in batches of only 200 pieces so get this special Aran knit while you can. Available in three colour ways - Skiddaw, Cinnamon and Khaki.